Viaje Cigars has announced that the Viaje Super Shot, a short smoke reminiscent of a shotgun shell, will be making a return for 2017. The name for the Super Shot comes from Farkas’ interest in clay shooting. Farkas was hoping to create a short smoke to have while taking a break in between shooting. The line made its debut in 2012 with the Criollo blend. The Super Shot made a return in 2013 with both the Criollo and a Corojo blend. The Super Shot has returned with its original blend in 2015, 2017, and now 2018. There have been several offshoots. Since 2013, Viaje has released the Viaje Zombie Super Shot annually. There also was a special Viaje White Label Project Super Shot in 2013. As with the previous installments of the core Super Shot line, there are two vitolas. Each vitola is sized to represent the Shotgun shells – a 10 gauge (3 1/2 x 54) and a 12 gauge (3 1/4 x 52). The cigars will come in 25-count boxes looking like a Shotgun Shells box. 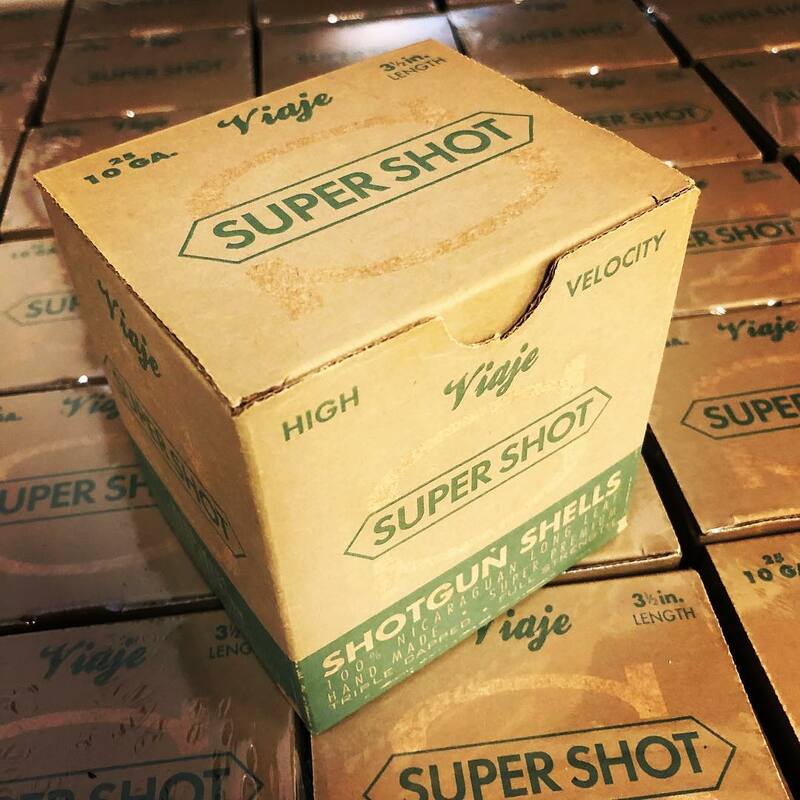 As with all releases, the Viaje Super Shot 2018 is a small batch release. We recommend contacting your local authorized Viaje retailer for notifications on any shipments of product into its shop. If you don’t have one, we recommend our friends at The Cigar Shop in Myrtle Beach. They have a mailing list and I’m sure they can notify you. The problem comes with most cigar companies, many do not notify media outlets when they have actually shipped to retailers – so we have no way of tracking it.